The body of an elderly woman was found Wednesday in a stairwell of a steam plant facility at San Francisco General Hospital. The San Francisco Sheriff's Office and medical examiner identified the body as belonging to Ruby Lee Andersen, who went missing from the Behavior Health Center near SF General. 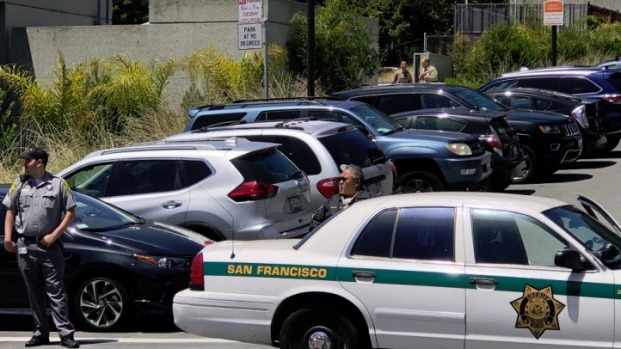 Andersen was found about 1 p.m. by a hospital staff member, who notified the San Francisco sheriff’s department, which provides security for the campus, officials said. The body was found in a stairway that has no alarms or cameras, sources told NBC Bay Area. The body of an elderly woman was found Wednesday in a stairwell of a steam plant facility at San Francisco General Hospital, officials confirmed. Pete Suratos reports. Andersen was not a patient at the hospital, Director of San Francisco Health Network Roland Pickens confirmed at a news conference Thursday. The Behavior Health Center and other facilities on the same campus are operated by the San Francisco Department of Public Health. Officials have implemented security assessments of all the hospital's buildings to make sure something like this can't happen again, Pickens said. Investigators are probing whether Andersen may have disappeared the week before from a residential mental health rehabilitation center on the hospital grounds a few hundred feet away. The treatment center issues day passes in some instances. It is unclear if Andersen had been issued such a pass. 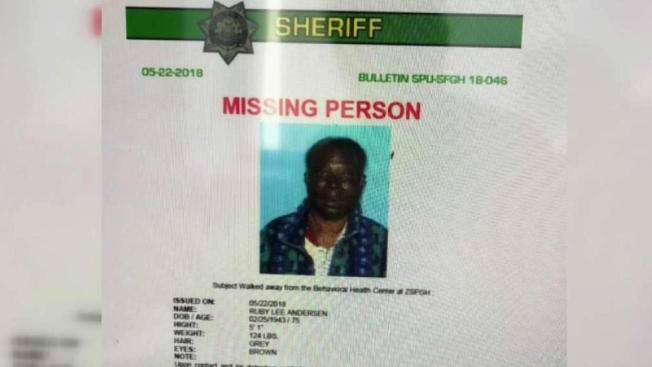 A flyer for Andersen missing was issued eight days ago, officials told NBC Bay Area, but it is not known how long she was missing before the flyer was distributed. Sheriff's officials said they notified SFPD in some way, but they did not file a missing person's report with the police. The body of an elderly woman was found Wednesday in a stairwell of a steam plant facility at San Francisco General Hospital, officials confirmed. Jean Elle reports. Wednesday's incident marks the second time a woman has been found dead in a stairway on the grounds of the hospital – the first being the 2013 discovery of Lynne Spalding, a 57-year-old whose body was found 17 days after she disappeared from her room. The Spalding family got a $3 million settlement – paid mostly by the city -- after what the family’s attorney called a “systematic breakdown” in the hospital’s protocols to protect patients. The University of California paid out $59,000 because its staff was involved in Spalding’s care. She was admitted on Sept. 19, 2013 with a bladder infection and vanished two days later. She was reported missing, but the stairwell near where she was treated was apparently not checked at that time. Her body was found Oct. 8 during a routine stairwell check. The discovery came after a doctor reported to a nurse on Oct. 4, four days before, that he had seen a woman, slumped over, in a stairwell. No one searched at that time, however. Spalding died of dehydration and liver problems related to alcoholism and had been dead for several days, according to the autopsy findings. Doctors wanted her monitored around the clock because of her weak and disoriented state at the time she was admitted. The case resulted in reforms of hospital security. The incident led to the firing of a dispatcher who had assured that the nurse on Oct. 4 that there would be a search of the stairway where the doctor reported the slumped woman. Five other deputies were subject to discipline and two supervisors were suspended. 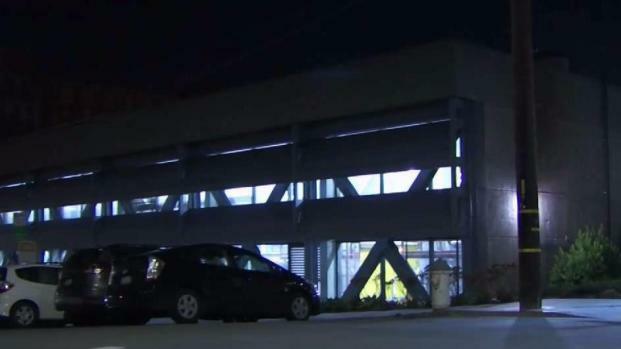 The body of an elderly woman was found Wednesday in a stairwell of a steam plant facility at San Francisco General, sources tell NBC Bay Area. Sam Brock reports. EDITOR'S NOTE: A previous version of this story misspelled Ruby Lee Andersen's name.